My interest in sports exploded in 2012. It all started with Jeremy Lin’s shocking rise to glory with the New York Knicks. This nerdy, Asian kid went from being shuffled around the league without a contract, to winning game after game. Like me, Lin graduated in 2010 from an Ivy League school! I couldn’t help but watch his every move and hope that my life would parallel his victories. When football season came around I was prepared to finally support NYC football. I saw the Giants’s ticker-tape parade from my office windows on the Canyon of Heroes and was almost swept away by the Super Bowl champs. Growing up in Maryland/D.C. I didn’t have many opportunities to represent a winning team – for any sport. But this year Redskins superstar rookie RG3 changed everything. Not only did the end of the season turn to seven straight wins, but we bested even the Giants for the division win! HTTR! And now I have to put my faith in another ‘home team’ – the Baltimore Ravens – to clench the Super Bowl win. Make enough for the crowd and a stash for yourself – these are good! I’ve been making these chicken wings for about 10 years. Drippy, tangy, sweet, spicy, and absolutely delicious; they’re ultimate crowd-pleasers. 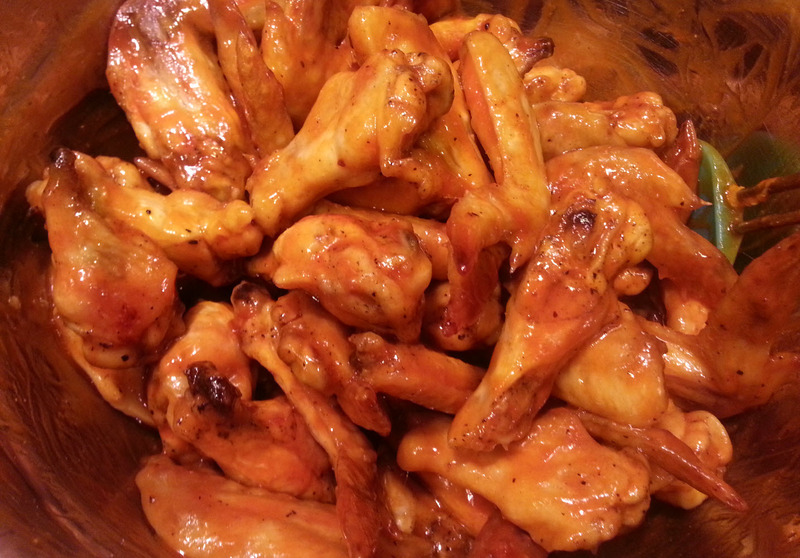 And, when all the wings are gone, the sauce is like nectar of the gods – delicious on everything. bake for 25-30 more minutes. Melt butter in a saucepan. Whisk in remaining ingredients until brown sugar is dissolved. Bring to a simmer and cook for 5 minutes until mixture is thickened. Remove from heat and pour in a large bowl. Toss in chicken wings and serve hot. These look tasty but kinda dry. BTW…No true Redskins fan would root for the Ravens #IJS…LOL!